Puget Sound Business Journal has named Denali CEO and Founder Majdi Daher to their exclusive 2019 Family Business C-Level Leadership Awards. Denali was also named to Puget Sound Business Journal’s 2019 Washington’s Largest Family-Owned Companies list which features family businesses who play a key role in the growth of the region’s economy. 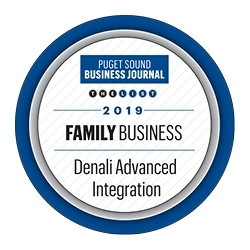 Redmond, WA, February 18, 2019 --(PR.com)-- Denali Advanced Integration, a global family-owned IT company, announced today that Puget Sound Business Journal has named Denali CEO and Founder Majdi Daher to their exclusive 2019 Family Business C-Level Leadership Awards. Daher was honored at the Puget Sound Business Journal Family Business Symposium and joined a panel of leaders who have taken their family businesses to greater heights. Honorees included Evia Corporation CEO and Owner Hilary Laney, Uniplex Construction CEO and Founder Joe Schwab and Laird Norton Company CEO and president Jeff Vincent. "Congratulations to Majdi Daher, CEO and Founder of Denali Advanced Integration, on being recognized as one of the 2019 Family Business C-Level Leadership Award Recipients. The Family Business C-Level Leadership awards were presented to top executives whose leadership has contributed to the success of their business," said Emily Kleiner, Publisher at Puget Sound Business Journal. Denali was also named to Puget Sound Business Journal’s 2019 Washington’s Largest Family-Owned Companies list which features family businesses who play a key role in the growth of the region’s economy. The 50 companies featured on the list brought in $19.8 billion in combined revenue in 2018 and employed 15,271 people in the region. Denali was founded in 1992 by the Daher brothers, Mohamad, Mitch and Majdi, through a shared vision of building a sustainable multi-generational family business with customer service and corporate social responsibility as founding principles. For nearly 27 years, Denali has continued to grow and deliver exceptional IT to their global enterprise clients based in North America. Learn more. "It’s a great honor to receive this recognition from Puget Sound Business Journal and to share it with such an esteemed group of family-focused business leaders in our region. Denali may be owned by the Daher family, but we consider all of our employees, partners and customers part of the family," said Majdi Daher, CEO and Founder of Denali. "Thank you to everyone who has supported our growth and customer-first vision over the years. It’s been an exciting journey but we’re just getting started." To further support the business community in the region, Majdi has joined the Puget Sound Business Journal Leadership Trust. As part of the trust, he will be providing insights to help people grow their businesses, advance their careers and simplify their professional lives. Learn more. Puget Sound Business Journal is part of the American City Business Journals (ACBJ) brand. ACBJ is the largest publisher of metropolitan business newsweeklies in the United States, with 43 business publications across the country reaching more than 3.6 million readers each week. Learn more at https://www.bizjournals.com/seattle/.